Buying a diamond is typically a new experience, but should not be an overwhelming one. To make better decisions, it is beneficial to understand a diamond's quality characteristics. Diamonds are among the hardest mineral on earth. Combined with their exceptional luster and brilliant fire, diamonds have become the most highly prized of all gems. It is a diamond’s brilliance, elegance and durability that have captivated our imagination for thousands of years. Endless folklore has been told about diamonds and their mystique. No wonder with all its beauty and lore that diamonds have become the symbol of love and romance. Over generations, diamonds have overwhelmingly become the symbol of choice by prospective brides and grooms vowing everlasting love while exchanging rings. Not only are diamonds the symbol of love, they are the cherished birthstone for the month of April. Diamonds are also the gift of choice for couples celebrating their 10th, 60th and 75th wedding anniversaries. Diamonds are graded using a system developed by the Gemological Institute of America (GIA) called the 4 C’s. The 4 C’s are: color, clarity, cut and carat. The 4 C’s help classify diamonds and determine their quality and cost. Every diamond is as unique as the person who owns them. Of the Four “C”, cut may be the most important visually. When a stone is not cut or manufactured correctly, color and clarity suffer greatly. The cut of a diamond refers not only to the shape of the diamond and number of facets, but also to the quality of the cut. A diamond with uneven or poorly proportioned facets, won’t be given the same grade of cut as an ideally proportioned and masterfully cut stone. A diamond's cut grade is an objective measure of a diamond's light performance, or, what we generally think of as sparkle. 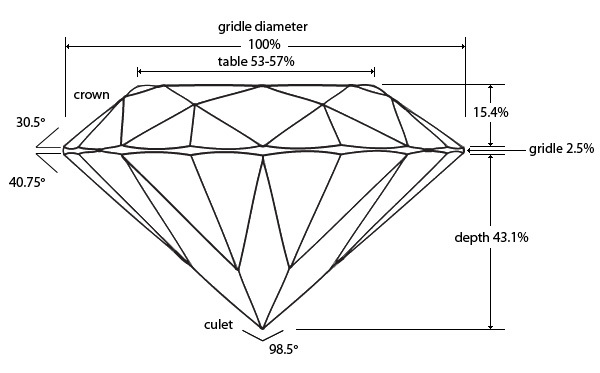 When a diamond is cut with the proper proportions, light is returned out of the top of the diamond (refer to as the table). If it is cut too shallow, light leaks out of the bottom; too deep and it escapes out of the side. Ideal cut: Reflects nearly all light that enters the diamond. An exquisite and rare cut. Very good cut: Reflects nearly as much light as the ideal cut, but not entirely and goes for a lower price. Good cut: Reflects most light that enters. Much less expensive than a very good cut. Fair cut: Still a quality diamond, but a fair cut will not be as brilliant as a good cut. In the strictest definition of the term, “cut” is not the same thing as shape. 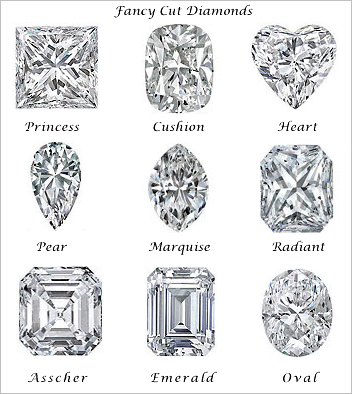 A diamond’s shape refers to its silhouette, for example: round, pear shape, marquis, square, emerald cut, trillion etc. However a diamond’s cut refers to the very exact mathematically determined proportions between its facets, so as much light is reflected out of the top of the diamond as possible. Most people think diamonds are colorless, however in reality diamonds come in every color of the rainbow from yellows and browns to green, blue, purple, red, pink, grey and even black. The “C” for color refers to the presence or absence of tinges of color in any particular stone. The closer a diamond comes to colorless, the more valuable it is. The color element of a diamond is created by chemicals or minerals captured in the diamond crystals as they grew in the earth’s surface over millions of years. For example the presence of boron would naturally give a diamond a blue tint and so on. Most diamonds are graded using the GIA color scale that begins with “D” for most colorless and continue up to “Z”. As the tints become more visible, the grade moves up the alphabet. However, the less presence of color noticeable in a diamond the rarer it is to find, therefore making it more desirable and valuable. Though GIA’s color scale grades diamonds between D (colorless) to Z (noticeable tint), there are also diamonds that exceed the diamond grading charts. These diamonds are much rarer to come by and are considered “fancy” in color. Fancy color diamonds are highly desirable and command higher value than diamonds which are on the charts. The “C” called carat refers to the weight of a diamond. It is derived from “carob” seeds which were originally used to weigh diamonds because of their precise weight of 0.2gr which is the equivalent weight of a 1 carat diamond. 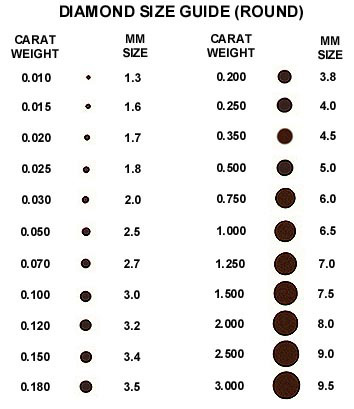 Diamonds range in size from any fraction of a carat to several carats in size. The carat scale is based on a metric system of 100 points = 1 carat. In other words fractions of 1 carat are reflected as diamonds weighing a fraction of 1. For example a diamond weighing 50 points is measured as 0.50ct. Given the rarity of larger stones, a diamond’s cost increases considerably as the size goes up. Clarity is the “C” that grades a diamonds quality and refers to the presence of surface or internal flaws and inclusions in a diamond which are caused throughout the diamonds growth or cutting process. A diamond’s clarity is determined by the number, size, type and placement of its inclusions. Inclusions include crystals or tiny gaps that represent small minerals caught in the diamond during its growth. Forms of inclusions appear as: pinpoints, needles, knots, chips, cavities, feathers and more. All inclusions add some sort of internal graining and may cause stress on the diamonds chemical structure. Though all diamonds have some sort of flaw or inclusion, GIA’s standard grading system helps determine the extent of these flaws. The less imperfections a stone has, the higher it appears on the clarity grading chart and more valuable the diamond. FL (flawless) – No external marks or internal inclusions visible to a trained eye under 10x magnification. IF (internally flawless) – Only minor surface blemishes but no internal inclusions visible to a trained eye under 10x magnification. VVS1, VVS2 (very very slightly included) – Few, very small inclusions and or finish faults that are difficult for a trained eye to see under 10x magnification. Typical flaws include tiny pinpoints, faint clouds, tiny feathers or internal graining. VS1.VS2 (very slightly included) – Very small inclusions and/or finish faults, somewhat difficult for a trained eye to see under 10x magnification. Typical flaws include crystals, feathers, distinct clouds and groupings of pinpoints. SI1, SI2 (slightly included) – small inclusions and/or surface blemishes easily seen under 10x magnification, but not visible face-up to a naked trained eye. Typical flaws include crystals, clouds and feathers. I1 (imperfect 1) – Inclusions and/or finish faults visible under 10x magnification, but hard to see with the naked human eye. Little effect on the brilliancy of a stone. I2 (imperfect 2) – More and/or larger inclusions and surface blemishes easily seen without 10x magnification. Some diminished brilliancy within stone. I3 (imperfect 3) – Many and/or very large inclusions and surface faults easily seen without 10x magnification. While diamonds are the hardest minerals, they still require some care to protect them from damage, diminishing brilliance, scratches and so on. Diamond jewelry can easily acquire a buildup of dirt, makeup and other materials that diminish its brightness, especially if worn every day. A regular professional cleaning is recommended, though avoid the use of ultrasonic cleaners or strong cleansing materials that can cause more damage than good. As we know diamonds are the hardest substance and yet what can scratch a diamond, is another diamond. To prevent scratches, it is suggested that you keep your diamond jewelry separated. Diamonds can also scratch other gemstones, so preferably keep them away from other items of jewelry with other stones. Since gold worn on a regular basis can wear and eventually weaken at certain points if not cared for on a regular basis, stones can become susceptible. More distressing than chipping or scratching a diamond is losing one. We recommend when going in for cleaning, ask your jeweler to check that all settings are tight and secure. A regular professional cleaning is a good idea to keep your jewelry looking its best. For home cleaning, you can use a stiff toothbrush and a mild ammonia and water solution, or gritty toothpaste. Gently scrub away any grime especially around the prongs or setting where build up is likely. Avoid touching the diamond with fingers as much as possible, since body oils will show on a diamonds surface. Wash gently under lukewarm water and dry with paper towel before water spots settle. As we now know, diamonds come in all colors of the rainbow in nature. The color of a diamond is dependent on minerals and crystals caught within the structure of the growing diamond. One of the many colors diamonds are found in, is Black. Though black diamonds are found in nature, it is rare that they are of gem quality. Most black diamonds, as well as mine, used in jewelry today are heat treated to enhance the even color in the stone and ensure its beauty. Though heat treating diamonds is not the natural form in which the stone is found, it does not compromise the fact that the stones are still 100% diamond material.